When you think of Thai food, no doubt a plethora of delicious dishes come to mind. Pad Thai. Green Curry. Tamarind Prawns. Shrimp Cakes. However, there is a whole other side to Thai food that you come across while traveling in Thailand. 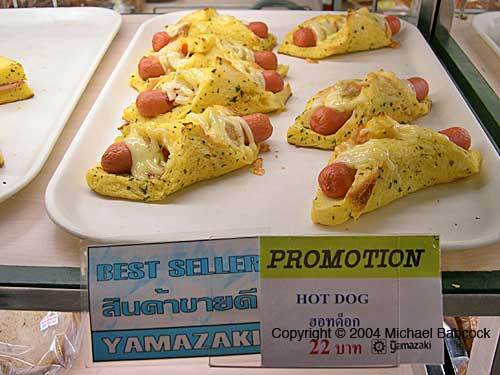 Often it’s the result of adapting Western foods into a Thai context: this can lead to food that you probably wouldn’t eat on a bet. 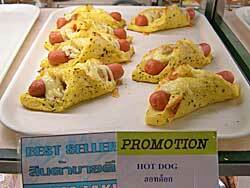 I say bring on the fried insects – one of the last things I would ever choose to eat in Thailand would be wieners with cheese in a crust, such as that found at a Bangkok mall. Thank you very much! There are a lot of other good dishes to eat. Each year, even in the open-air markets, I see more Western foods for sale, particularly the sweet stuff. Decorated cakes seem especially popular – the picture to the right was also taken at a shopping mall in Bangkok. There’s even a chain restaurant, S&P, that is known for their Western-style cakes. If what I see in the markets is any indication, Thai people do have a sweet tooth. 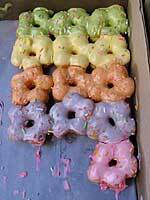 These brightly colored donuts are from an open air market in Bangkok. I’ve also seen donuts on a stick. 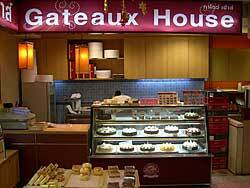 Two or three years ago, a Thai friend took us out to dinner and then, as a treat, took us to a trendy dessert place. 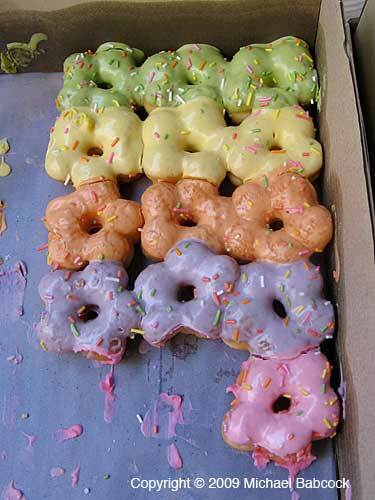 The main attraction there was big, puffy, white bread that was toasted, cut into chunks, and served with a cloyingly-sweet syrup; most of the syrups were brightly colored, much like the donuts in the picture here. 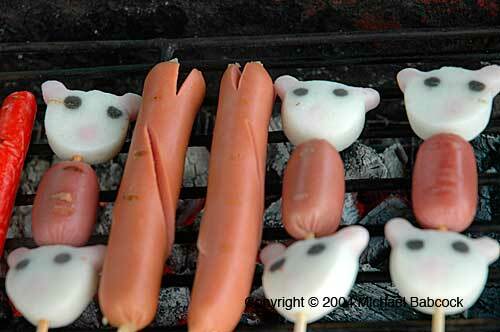 I get a bit of a chuckle out of what I think of as “cute food.” The best example I’ve seen was at a park in Krabi – it was little cute faces on a stick along with wieners. I’m guessing it was some kind of fish paste; I confess I did not have the desire to actually try it. Written by Michael Babcock, March 2009. You are currently browsing the Thai Food and Travel Blog blog archives for March, 2009.